The ITER DG provided a detailed explanation of ITER, underlining the remarkable progress of the project in the last years pointing the way to first operations by the end of 2025. Johannes Schwemmer highlighted the role of the European Agency Fusion for Energy (F4E) in delivering the EU contribution, and the significant benefits of investing in the biggest international research project in the field of energy. The manufacturing of the EU components represents a significant injection of EU funds in the industrial fabric of the Union generating growth and jobs for the economy and new business, lasting international partnerships and innovation for the participating companies. 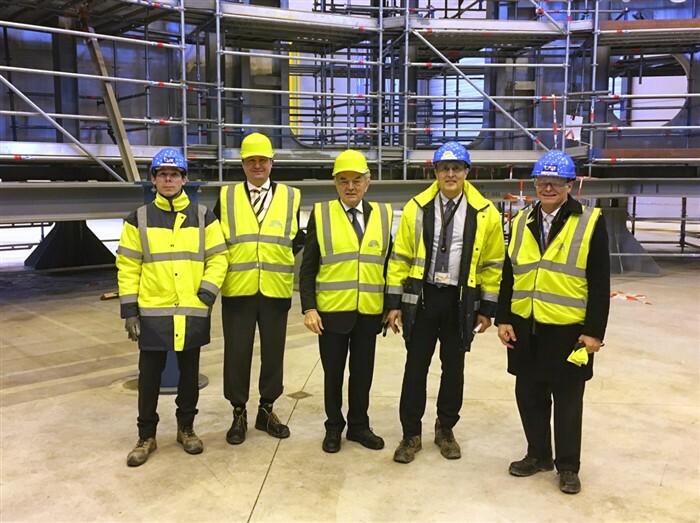 Accompanied by the ITER DG and the F4E Director, the French MEP spent more than two hours on the site currently dazzling with activity, with stops at the Poloidal Field Coil Factory to witness the progress of the gigantic poloidal field coils manufacturing and at the Cryoplant where Europe has installed the liquid nitrogen plant of the impressive cryogenic system needed to cool down the powerful magnets of ITER. The site tour continued with a visit of the Cryostat workshop where the Indian Domestic Agency is manufacturing the largest stainless steel high-vacuum pressure chamber ever built, inside which the ITER machine will be housed, before arriving at the towering Assembly Hall where some of the components will be pre-assembled before being installed in the adjacent Tokamak building, the heart of the ITER machine. Following the visit of the ITER site, the Chairman of the Budget Committee expressed in his social media account (@JeanArthuis) his admiration and pride for ITER, "a project that epitomizes what intelligence, science and technology have the audacity to undertake for the future of humanity."